Size Selection: 24" x 30"
Size Selection: 24" x 36"
Size Selection: 24" x 48"
Size Selection: 30" x 48"
Size Selection: 30" x 60"
Size Selection: 30" x 72"
Size Selection: 24" x 72"
Size Selection: 36" x 60"
Size Selection: 36" x 72"
Size Selection: 42" x 72"
High pressure laminate surface features heavy-duty construction-safe, non-toxic and stain resistant in your choice of 2 top colors: Gray Nebula and Maple. Specially designed smooth, wrap around t-mold edge accents come in your choice of 15 trim colors: Blue, Yellow, Fuchsia, Red, Navy, Burgundy, Purple, Teal, Forest Green, Dustin Green, Black, Tan, Sour Apple, Autumn Orange, and Graphite. 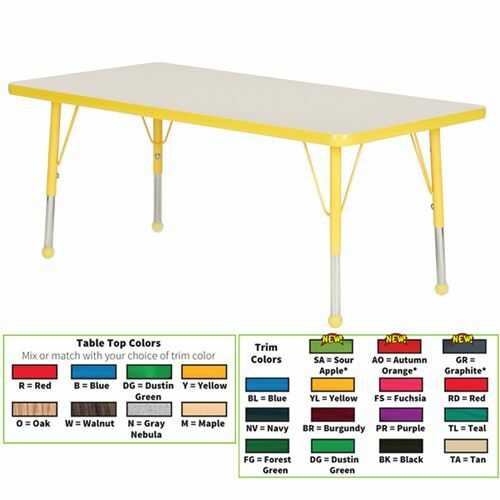 Leg uppers are powder-coated to match trim(*) and come with matching colored ball glides, unless nickel-plated self-leveling glides are specified (additional $3.31 per table). *Sour Apple, Autumn Orange, and Graphite come with brushed metal color legs. Please specify Toddler Size Legs (16" - 24") or Standard Size Legs (20" - 30"). 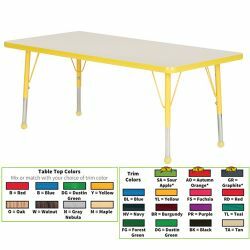 Please specify your choice of top color, leg color and leg size. Additional shipping charges apply.